'It's Just Time For Me To Go,' Says Virginia State Police Superintendent : The Two-Way The moves follow an outside review that found law enforcement made disastrous errors in handling the "Unite the Right" rally. 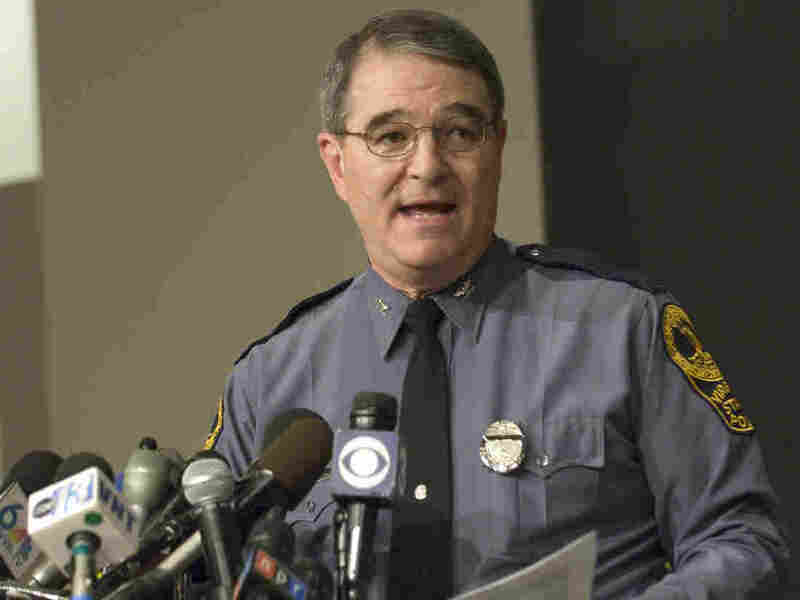 Charlottesville's police chief had announced his own retirement Monday. Virginia State Police Superintendent Steve Flaherty announced his retirement Tuesday after 42 years with the force. Flaherty is pictured here in 2007, briefing the media following the shooting at Virginia Tech. The superintendent of the Virginia State Police said he is stepping down, just a day after the police chief of Charlottesville, Va., announced that he will retire. Virginia Gov.-elect Ralph Northam announced Col. Steve Flaherty's retirement and appointed his successor, Lt. Col. Gary Settle. Flaherty said it was his own suggestion to move on during meetings with Northam's transition team, the Richmond Times-Dispatch reports. The moves come less than three weeks after the release of an independent review that found law enforcement and Charlottesville officials had made a series of disastrous errors in their approach to the white nationalist rally there in August. The superintendent said his retirement was unrelated to the Charlottesville events and was something he had been planning a long time, according to Times-Dispatch: "It's just time for me to go," he said. "Having the opportunity to serve in the capacity of Superintendent these past 14 years and three months has truly been the greatest honor of my life," Flaherty said in a statement. He served 42 years with the state police.